Fiji’s future development will be balanced to ensure a sustainable and vibrant rural economy and highly liveable urban centres that has modern facilities and services. This is one of the key action elements of the National Five and Twenty Year Development Plan which was launched in Germany by the Prime Minister and COP23 President – Voreqe Bainimarama. Government estimates that Fiji’s population will exceed 1.1 million in the next 20 years, and the vast majority will live in our towns and cities. The Development Plan includes a strategy to provide Fijians with affordable and adequate housing and this will require improving the skills of our rural carpenters through focused training programmes to enable them to build back better. 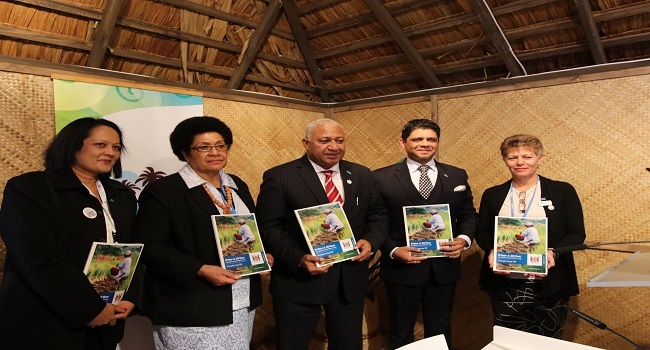 Bainimarama also highlighted that Fiji will also continue to explore opportunities for disaster insurance schemes with bilateral development partners and multilateral financial institutions. The plan also includes moves to improve our food security through the promotion of organic farming and increase production of traditional crops under programmes for niche agricultural and fisheries products. As well Fiji plans to develop a world-class skilled workforce to drive economic growth by investing in our teachers, modernising our schools and maintaining universal access for all levels of education, including early childhood, vocational and higher education. There is also a plan to raise raising the standard of health and medical services by building modern healthcare facilities and recruiting more qualified healthcare professionals. The 20-year Development Plan, sets out a broad strategy to guide Fiji’s development focus over the next 20 years. The Five-Year Development Plan, which is aligned to the long-term strategy, contains a properly sequenced comprehensive plan of action for the period 2017 to 2021.